Every werewolf knows the meek won't inherit the earth. Enter Hunter Green, an uber-alpha strong enough to stop traffic with a single look. 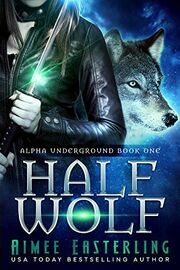 He's handsome and enticing and seems like just the ticket to broaden Fen's horizons...until the uber-alpha brushes off his admirer and summarily rejects her from her home pack. USA Today bestselling author Aimee Easterling's new urban fantasy novel is chock full of adventure, romance, and danger and is bound to leave readers craving more.